thanks for the info, I don't want to get into having a extra set of rims and tires, Would you still recommend the 21's if they would be kept on year long with all season tires? I don't think so. I would go with the 50Rs, if you don't mind the looks of those. The ideal solution, except for cost, is to the the AMG Line exterior (which most thinks looks much better) and the 20" RZV or RZW AMG rims. Compared to the R77s at $1,750, that's a $1,500 upcharge but IMO far better looks including the studded grille, painted sills & wheel arches, better brakes and the sport exhaust with functional outlets in the rear fascia. A lot of value that I'm pretty sure you would get back in resale. Last edited by GregW / Oregon; 03-24-2019 at 08:55 PM. I am reposting the pricing worksheet I developed, updated to the 3/14 DOG. Last edited by GregW / Oregon; 03-24-2019 at 10:44 PM. Thanks for suggestions on tires. What would you suggest if one is getting a 3rd row option since they are giving run flats for 3rd row with no spare? Are these good for snow as well? We ordered the 3rd row. We wernt told there is no spare tire. Is that correct? Yes, it is, since the 3rd row seat uses up most of the underfloor space. You get runflats with 19-20" wheels and Tire Fit, which I assume is a compressor/sealant system, with 21". You can always do like I do on my M4 and get a space saver spare to throw in for trips. Last edited by GregW / Oregon; 03-24-2019 at 11:55 PM. I have no personal experience with run flats, but the All Seasons should be comparable in snow. I don't know that run flat true Winter tires are available in the correct sizes though. It’s the same with the X5 (well most BMWs). We just bough a BMW X7 which has RF tires. There's a lot being made about RF's but I honestly cannot tell any difference in the ride and when it comes time to replace them, I can also go with regular tires. So if you want the 3rd row in your new GLE, I wouldn't worry about the RF's. 3 in the morning in the middle of nowhere is a turn off for me, plus everything I read they don't ride as well as non run flat tires and get flats more often then regular tires. What are the options for a three-row with spare, then? X7 has option for regular non-run flat tires and a spare tire for $150. 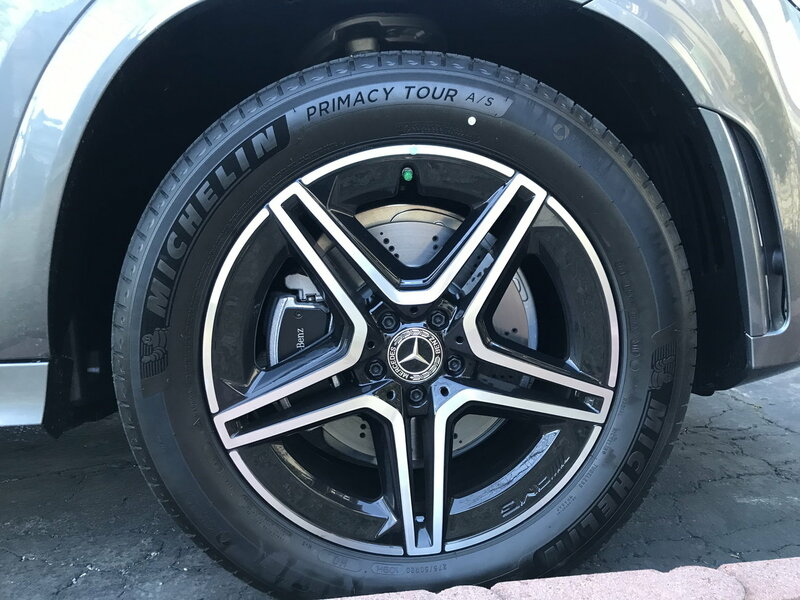 The current GLS has regular tires with a spare, hopefully the new one coming out will also have a spare and use non-runflats. Volvo XC90 is a 3 row that also has regular non-runflat tires with a spare tire. I've read that too but never actually experienced RF's personally. I can only tell you the X7 is every bit as smooth and comfortable (with RF's) as the GLS 550 we traded. So if you need a 3rd row, I wouldn't jump ship because of RF's. MB would never go that direction if it made their GLE ride to harsh. Check local inventory for a GLE with the 3rd row option and give it a test drive. More than likely it'll have steel springs but at least you'll know if that setup works for you. We dont need a third row. We have a Enclave with third row that we can use. It was just a nice option to have. We just need to figure out what is more important a third row with no spare and run flats or no third row with regular tires and a spare. Well, it might be because under 40 degrees they are basically hockey pucks. Wow, I say this exact same line right down to the hockey pucks all the time. People don't get it... forget about snow... anything under 40 degrees and summer performance tires just aren't safe. You are a wise one, BigHat! I prefer non run-flats and it's actually one reason I'm wanting this GLE instead of an X5. Yes, I have experience with both RF and non-RF, even on the same car. The ride is absolutely diminished with RFs. No doubt about it. The whole point is a sidewall that remains stiff enough to drive 50 miles with a puncture. So it doesn't flex like a regular tire and ride suffers. Suffers a lot less vis-a-vis a super low-profile regular tire that doesn't have much sidewall to begin with, but in a back to back comparo you will notice the stiffer ride. RFs have gotten better and Joe's X7 probably has the suspension chops to make things glass smooth, but the same car would be even better on regular tires. RFs are also more expensive to replace and you'll have to replace them more often because if you crash a pothole hard you are more likely to breach the integrity of the RF sidewall, and you'll need a new tire. Ask me how I know. Was it long ago that you had your RFs? I've heard that they have gotten a lot better more recently but I don't know if that is true or not. Until 2017 BMW had 4 years/50k free maintenance - now still better than MB. Does anyone remember when Mercedes had free maintenance? I think it was with my W163. Now Mercedes 3/30 maintenance is $1,500 on the GLE. When they dropped from the 4yr incl maint to the 3yr, that was just as I ordered a '17 vehicle and was trading a '14. With that, they also no longer included free wiper blades and brakes. On the '14 I got new wipers ea year and they replaced the front brakes once near the end of the lease (can't remember if it was just pads or also the rotors). I may just go do the BMW driving experience thing at the plant, just in case that's the direction we go in. This rollout of the 450 is strange, at least it seems so to me. I'd say yes, definitely go for a day at the Performance Center if you get a chance. I have been 3x. Twice when I picked up my last 2 cars, and the 3rd time was last year for the 1 day car control school. You will certainly have a good time. However, don't give up on the GLE purely because of the rollout. We have had several vehicles from both makes in our household. They each have their strong points. It was a MY'16 BMW. So maybe I'm wrong and they're vastly improved since then. I don't think so, though. I just think the trend toward lower sidewalls for the sake of aesthetics (and I get it, because I like the looks, too) is killing the ride for a lot of vehicles, not to mention constant risk of curbing an expensive wheel. Add worsening roads and RFs into that and it's a nightmare. I was originally going to go with the 21-inch wheels but come to think of it I may stick with the 20s.